Agnes "Sis" Cunningham of Broadside Magazine in Resurrection City during the Poor People's March on Washington, 1968. Sis Cunningham (1909-2004) and her husband Gordon Friesen were born in rural Oklahoma, Gordon in Weatherford and Sis in Watonga. After attending college, Sis briefly taught high school music, then attended Commonwealth College near Mena, Arkansas, a labor college with socialist overtones where her musical abilities—singing, songwriting, playing the piano and the accordion—were now put to good use. Following Commonwealth, Sis became an organizer for the Southern Tenants Farmers' Union, and worked briefly as a music instructor at the Southern Summer School for Women Workers near Asheville, North Carolina, before returning to Oklahoma in 1939. Here she helped organize the Red Dust Players, a traveling troupe that entertained and sought to mobilize the state's poor with radical songs and skits. Sis and Gordon met in March 1941. Oklahoma was undergoing a frightful Red scare, and the local Communist Party was under attack from the state government. Both members of the party, Sis and Gordon reacted with outrage and panic during the arrest and trial of the state party's leadership after its Oklahoma City bookstore was raided and closed down. On the run, fearing their own arrest, Sis and Gordon, who married on July 23, moved to New York City in late November 1941. They briefly lived with a friend while Gordon shopped around the manuscript of a second novel and Sis picked up odd jobs. Pete Seeger, who had met Sis previously, invited them to Almanac House, 130 West Tenth Street, and they quickly moved in. A year earlier, Pete Seeger, Lee Hays, and Millard Lampell had formed a topical singing group soon named the Almanac Singers. Sis and the Almanacs maintained a busy performing schedule, and she appeared on their 1942 album Dear Mr. President for Keynote Records. In late 1942, Sis and Gordon moved to Detroit, joining their friends Bess Lomax, Butch Hawes, Arthur Stern, and Charlie Polacheck, who were attempting to establish a branch of the Almanacs in the Motor City. When their singing jobs dried up, Sis went to work in a war plant, and Gordon became a reporter for the Detroit Times. Sis performed and wrote songs for People's Songs, a radical musical organization initiated by Pete Seeger for struggling labor unions, and for Henry Wallace's third-party presidential campaign in 1948. With the births of their two daughters and mounting economic problems, her musical life wound down by decade's end. She also felt pushed out by the urban performers with more style and polish. The following decade was a nightmare for Sis and Gordon: they were plagued by sickness, wrenching poverty, and endless battles with the welfare department. Sis and Gordon picked up an odd job now and then, but music vanished from their lives. "We had no money for any kind of recreation," she recalled. "Rummage sale clothes, shoes, soup kitchen food, job hunting for the next rotten job. Looking for some place to live—not just exist." As the 1960s dawned and the fear of communism began to wane, Sis and Gordon had little reason for optimism. Yet with radical commitments intact and a belief in the transforming power of music, they eagerly welcomed the chance to publish a topical song magazine. Sing Out!, the national folk publication appearing five times a year, rarely recognized the current crop of topical songwriters, so the field seemed ripe for a contemporary folk magazine. "Pete Seeger and I have been discussing, cross continent, a project that we'd like to put before the readers of Sing Out! for advice, comment, and discussion," Malvina Reynolds wrote to Sing Out! in late 1960. "I am proposing the publication of a song book or journal of topical songs, to be called Broadside. This would begin to round up, and make available all over the country, the songs that are arising out of the peace, labor, civil rights movements in different areas." Sis, intrigued by the budding crop of songwriters, discussed the possibilities with Pete Seeger. Inspired, Sis and Gordon plunged into producing a topical song magazine. They solicited advice and money from a few dozen friends. Sis served as Pete Seeger's paid secretary while the Seeger family conducted a yearlong world tour from 1963 through 1964, and over the years key financial help came from Pete and Toshi Seeger, but it was never enough. Sis and Gordon always lived on a shoestring. As the editor of Broadside, Sis guided one of the most influential music magazines of the time. Between 1962 and 1988, Bob Dylan, Janis Ian, Rev. Frederick Douglass Kirkpatrick, Phil Ochs, Malvina Reynolds, Buffy Sainte-Marie, Pete Seeger, and dozens of other socially conscious songwriters published their finest works in its pages. Broadside music fueled the Folk Revival and other political and social movements. 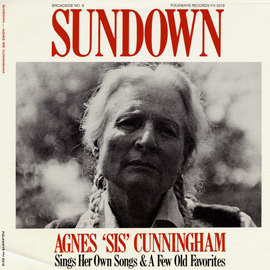 In 2000, Smithsonian Folkways Recordings honored Sis's work in The Best of Broadside.. This Grammy-award nominated 5-CD boxed set features 89 Broadside songs, most performed by the artists who wrote them. 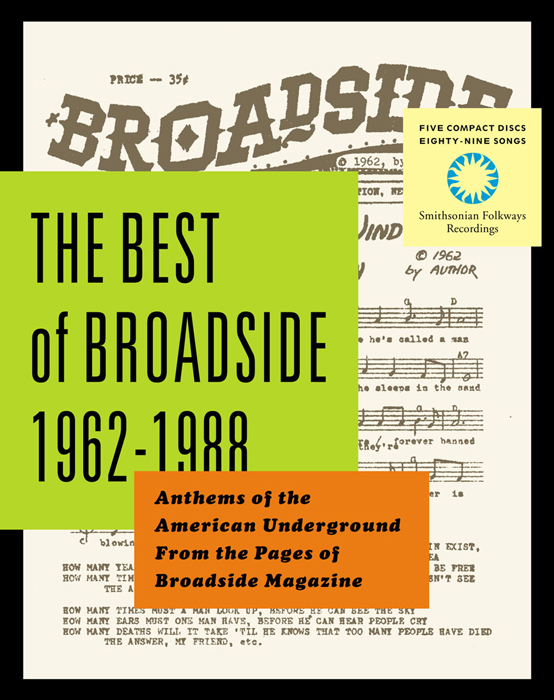 Culled from the Smithsonian Folkways collection, tapes from the magazine's office, and tracks released on other labels, The Best of Broadside. provides listeners with a 25-year overview of performers, topics, and musical styles. 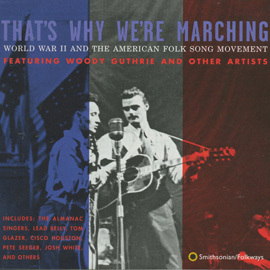 Songs include "Blowin' in the Wind," "Little Boxes," "Society's Child," and scores of other now classic songs addressing issues of concern to Broadside composers—from nuclear warfare to the war in Vietnam, ethnic conflict, immigration, and women's rights, to ecology, racial equality, and social justice. Sis Cunningham, apart from editing Broadside, is a multi-instrumentalist, playing guitar, piano, and accordion. In the 1940s, she was a member of the Almanac Singers with Pete Seeger, Millard Lampell, Lee Hays, Bess Hawes, and Woody Guthrie. As finances got worse and worse she ceased to play music, concentrating on day-to-day life. During the Broadside years she was the individual who transcribed the music from the home recordings in order to put the music notation into the magazine. She took part in various Broadside hootenannies, eventually recording a full album, Sundown, produced by Paul Kaplan. Text and quotes extracted from the notes by Ronald D. Cohen and Jeff Place accompanying The Best of Broadside.